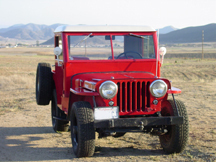 The 1946 CJ2A Willys was purchased in 1953 by my dad Allan Bovee. It had been purchased new by a man that was a volunteer firefighter in Indio, California. He painted the entire Jeep, except for the white top, fire engine red. Originally it was a Normany Blue with the White top. Over the years it’s been painted twice staying with the red and white with the light gray interior. The CJ2A is now jointly owned by Steve and Wayne Bovee after their father passed away two years ago. The original Willys half cab came with a canvas curtain that would snap to the inside and enclose the front half. It also came with a rear canvas top that attached to the side of the front cab. In the late 50’s the Jeep had a PTO winch on the front bumper but, the PTO was later switched to the rear for a Ramsey 9000 lb. winch when he put the overdrive in. Other additions to the now “restified” 1946 CJ2A are the Dualmatic hubs on the front wheels for disengaging the axles from the wheels. A Saginaw steering box conversion to replace the stiff cam and lever style set up. A 12 volt system replaced the 6 volt except for the starter, which seems to handle the 12 volts fine. The CJ-3A steps were added at the request of their Mom, their Dad soon learned that they must be removed for the serious four wheeling after bending them back several times. Steve and Wayne are looking for an original heater to put back in it, and a vacuum driven wiper motor to replace the electric one. Some information that they are looking for: How long were the Willys hard cabs available? How many were produced with the “Meyer’s” top? In later years there were the Sears and Koenig hardtops, that adapted to the hinged windshield, but none like this one. Are there any Jeep advertisements portraying the “metal body enclosure” as it is called in the options list? 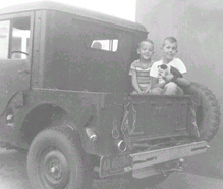 Steve has pictures of Jeep runs in the late forties with a couple of these hardtops. They probably were removed due to their weight and making them more top heavy. If you have any information for Steve, or questions, contact him at Steve2Shyrle@ juno.com.